A week of U.S. Naval Academy festivities accompanies the Graduation and Commissioning ceremonies at the Navy-Marine Corps Memorial Stadium in Annapolis, Maryland. Each year, more than 1000 of America's best and brightest young men and women graduate and receive their commissions in the U.S. Navy and U.S. Marine Corps. 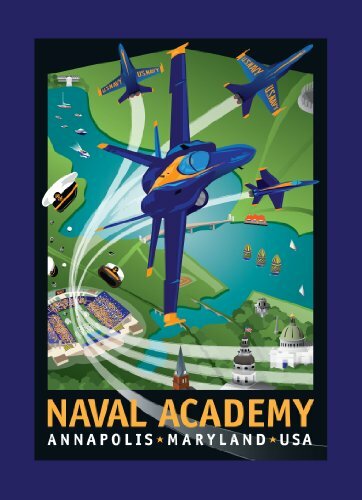 This illustration pays tribute to the excitement and energy the Commissioning Week brings to Annapolis,Maryland. The hallmark of the week is the Blue Angles air show within their F/A-18 Hornets over the Severn River. The Blue Angels also fly a formation flight over the stadium during graduation. Another memorable tradition that is understated in this poster is the Herndon Memorial Climb. The freshman (Plebes) form a human pyramid to climb to the top of a tall gray obelisk monument that is covered in grease to replace a first year student's dixie cup hat with a midshipman's hat. This art print, illustrated by Joe Barsin of Annapolis, MD, makes for a great note card.